Four Elefants and supporting SS panzer-grenadiers try to exit by attacking through a village held by the Soviet 10th Guards Tank Corps. 2018-08-06 (A) Jeff B vs Magnus Rimvall German (SS) win I approached this scenario with what I can only imagine is an uncommon plan of attack. I had no intention of exiting any vehicles, but rather push the Russians out of town and both trenches. Unusual for a SP scenario, there is actually a fair amount of time in this one, despite the extra MP penalty for the wet ground on the already tediously slow Elephants. With this goal in mind I setup two tanks to bombard the hill trenches. They immediately paid dividends when the HMG-manning squad was turned berserk and the leader with him wounded. It would take them two turns just to reach the nearest enemy units and, unfortunately for them, it was my kill stack. One shredded squad. My SS pushed the Russians out of town like they were casually sweeping the floor. By this time my opponent realized my plan and planted both tanks up on the hill. This of course caused me to change tact and go for a vehicle exit. I had yet to see the gun though and was getting to the point where I thought he might get some side shots. Of course my opponent once again repositioned his tanks, coming down off the hill to swarm my lead vehicle and leaving his one leader and squad (both with their 3 RoF weapons) to fend for themselves. A lucky motion-kill by one of my Elephants left him just 1:3 on my tanks (one of which had been recalled earlier due to a MALF'd MA), but his gun finally sprung its trap and went for a side shot on my middle tank as it "sped" to assist its comrade. Of course he MALF'd the gun on its first shot and it was game over. This was a fun scenario, but I do think I would take the Russians in this one as there are just too many things that can go wrong for the Germans. There is a lot of open ground to cross to reach the hill and no smoke availability whatsoever. 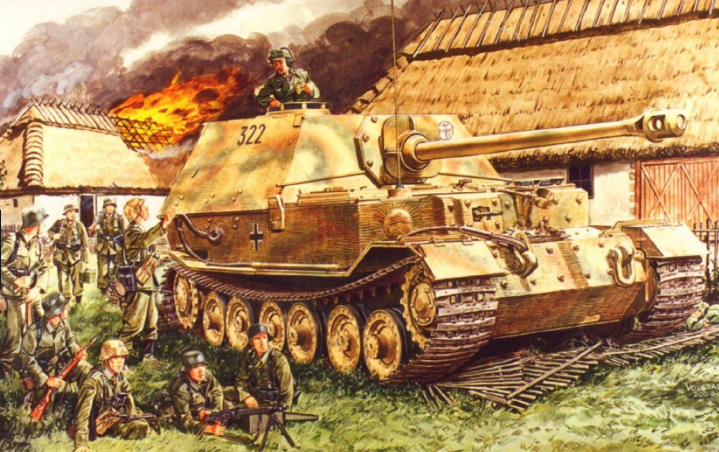 That, the threat of the gun, the limited exit hexes, the ability of the Russian tanks to play guard, the HMG and mortar, and the wooded terrain on top of the hill leave the distinct possibility open of causing just the one hiccup needed to spoil the Germans' plans. 2018-08-03 (A) Michael Rodgers vs Tim Deane German (SS) win I had some early luck. One Elefant with the AL was able to pick off the Russian HMG and mortar teams on the distant hill. 2018-07-15 (A) Gordon Jupp vs Derek Cox Russian win An excellent scenario which is definitely worth a play. The VC are unusual and there will be many ways to play this. In our playing the Russian sniper was very active and took out two of the German leaders by T3, but it went down to the last turn and was great fun! 2018-07-14 (D) Stephen dedier vs Holt, Jim Russian win This was a very enjoyable scenario with several swings in momentum. I setup to defend the town and opted not to put my HMG in the steeple but in the graveyard. I put my mortar and ART in the trenches on the 2 L2 hills with a crew and 1.5 squads. My tank I put in the near the entry hexes for the 2nd tank. My strategy was to try and hit the infantry with the art and mortar as they came into town and hope to have the elephants delay long enough there that they had to rush to the edge and I could come in to assist my troops in holding onto the town and victory points for the buildings. That didn't work out. The town mostly fell in 2 turns with failed MC right and left by my elite trops. They did manage to destroy an elephant in VBM for a key win. I managed to force a battle for the steeple until turn 4 and resurected a broken unit outside the town which kept several German squads busy cleaning them up. My sniper proved one of my better team members by breaking and then eliminating the German HS with the shreck. This created a road opening for my tanks. Jim got a bit anxious to get the remaining elephants off knowing my ART really couldn't to anything to them. However, he split the three of them up and I was able to chase one down and kill it from behind and catch another in the next turn killing it from behind. At this point the Germans needed to take one of the hill hexes (they had the steeple and were going to exit one elephant but needed more VP than the Russians). I diverted my tanks onto the hillside in defense of the hilltops for the final German assault. I was able to break 3 squads and a leader that was needed for the MP to keep the Germans from a CC on any one of the hexes. I really thought it was lost when the town fell so quickly. Neither of us are 100% on the spin tactics that can be used against a rear attack in movement or on gun duels and I think both of those tactics can be used effectively in this scenario. It is also extremely helpful that the PF have only a range of 1 in this scenario.